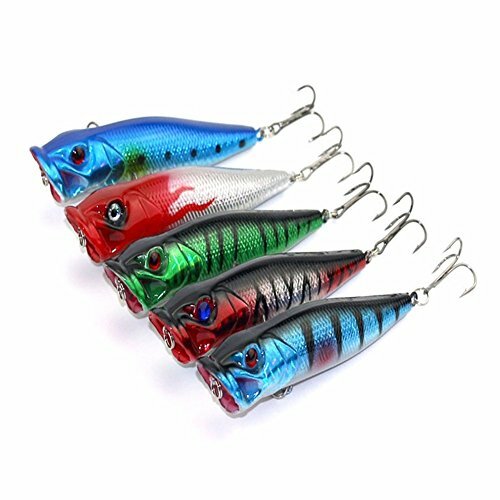 5pcs/set Plastic Popper Fishing Lures Bass Crankbaits Tackle With High Carbon Steel by Isguin at Kerinci. MPN: 2018ISGUINSPORTBK591. Hurry! Limited time offer. Offer valid only while supplies last. Carbon steel treble hook makes it solid and durable. Vivid fish shape design with exquisite workmanship. Ideal for beginning and experienced anglers. Carbon steel treble hook makes it solid and durable. Vivid fish shape design with exquisite workmanship. Ideal for beginning and experienced anglers. With strong simulation ability, works effectively for you. Suitable for fresh water and sea water. Multi-colors display the the real world in the sea. It is perfect tool for you when you go outside for fishing.